You are viewing an archived version of RobWeychert.com. Don’t forget to go back to the future. 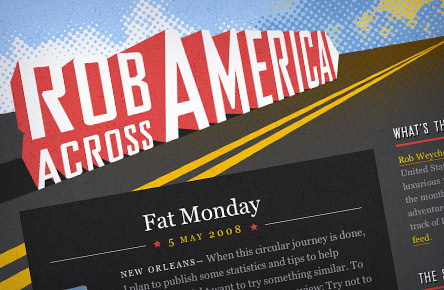 Half the reason I went on a month-long cross-country road trip in May of 2008 was to document it, and I designed the Rob Across America blog for that purpose. The design is intended to reflect the trip’s infectious enthusiasm, a sort of a tour poster that compels you to find out when the tour will be rolling into your town. With that in mind, I designed it as if it were a four-color silkscreen print.